While promoting X-Men: Days of Future Past at WonderCon over the weekend, producer Simon Kinberg revealed new details about The Fantastic Four reboot, confirming that this version of the Marvel comic books is more of a coming-of-age story, while teasing how Reed Richards (Miles Teller), Johnny Storm (Michael B. Jordan), Sue Storm (Kate Mara) and Ben Grimm (Jamie Bell) get their powers. Since this is a much younger cast than the original 2005 Fantastic Four, the story is said to be reminiscent of the Ultimate Fantastic Four comics, where the four main characters are all in college. Simon Kinberg revealed in an interview with Den of Geek that the reboot is still an origin story, but they still have a lot of growing up to do. "We're definitely telling a younger story that the original films did. It depends on what books you look at. There are some, like the Ultimate books, that tell this story. So it is an origin story of the Fantastic Four, and it does follow them before they really know what a superhero is. They're older than high school, but they're not quite grown into the world. If anything, this is a coming of age story." The writer-producer also confirmed that production starts in just two weeks, on location in Baton Rogue, Louisiana, although he wouldn't reveal any specific plot details, such as how these characters get their powers. In the original Fantastic Four movie, the characters were given their abilities after being exposed to cosmic radiation in outer space. While it may not be terribly plausible to have younger, college-aged kids in space, the producer teased that their powers will be the result of some sort of "scientific travel." "There is archetypal imagery of how they get their powers, for sure, and it does involve some sort of scientific travel." In the Ultimate Fantastic Four comics, Reed, Johnny, Sue and Ben receive their powers after a teleportation experiment goes awry. The producer also spoke with Crave Online, where he compared the tone of this new story to The Fantastic Four filmmaker Josh Trank's directorial debut, Chronicle, and Sam Raimi's original Spider-Man trilogy. "It's a much more grounded, gritty, realistic movie than the last couple movies. If I had to say, the tone of it would be somewhere on the spectrum between Spider-Man and Chronicle. The other movies were even further on the spectrum of being goofy and fun than Spider-Man. Josh Trank's instincts are to be as realistic and grounded and real with this stuff as possible. In many ways I would say it's definitely more of a drama than comedy." 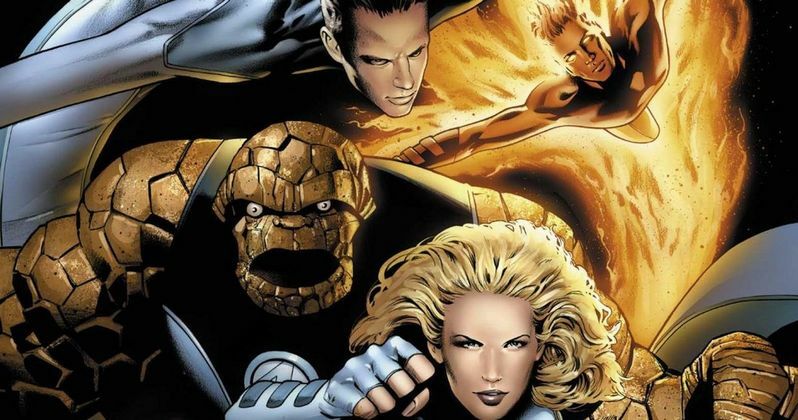 However, since The Fantastic Four comics are traditionally some of the lighter and less serious comics in the Marvel stable, the writer-producer revealed it won't be as dark as The Dark Knight, while keeping the science behind these characters more grounded. "It's still in the direction of Spider-Man. It's not like Dark Knight. And even Chronicle has a lot of fun in it. We're treating this as the origin of the Fantastic Four so in future movies you'd have them on sort of splashier adventures to some extent but in this one we tried to ground the science as much as possible and make it feel like it could take place in our world before it cantilevers into other worlds." These comments fall in line with what actress Kate Mara had to say about the project earlier this month, where she said that this is a much more grounded version of a superhero movie. She also hinted that the main characters may not be wearing their trademark blue spandex suits, an aspect of the production Simon Kinberg teased in yet another interview with Collider. He confirmed that the story is set in modern day, and said that they did have the costumes ready to go, although he isn't sure when we'll be able to see what they look like. "I don't know what the plans are for the publicity. We start shooting in two, three weeks. I went to Baton Rouge the day before yesterday. I go back there tomorrow. We have the cast. We have the costumes." When asked how the costumes compared to the original Fantastic Four movies, the writer-producer had this to say, reiterating that the story is not as serious as The Dark Knight. "The thing I would say overall about the film is that it's a much more grounded, realistic, dramatic version of the film than those are films were. Which isn't to say it's Dark Knight. It's not. It's still fun." While he wouldn't give a concrete answer, many fans have been wondering if The Fantastic Four will feature Annihilus alongside Toby Kebbell's Doctor Doom. Here's what he had to say, while confirming that the production will run until the end of August. "I'm not going to give any comment on that [laughs], but I'm happy you're curious about it. We shoot most of the summer until around end of July, August. I don't know how many days. But we start soon and end in August." We also reported earlier this month that the Doombots, clones of Doctor Doom who do his bidding, may also be featured in this reboot, but that has not been confirmed either.